It’s funny when I sit back and think about the early days of the “House of Horrors”. When I originally decided to do the site, I was initially going to focus on ten definitive films in the genre and luckily “Scream” wasn’t one of them. One that was on the list was John Carpenter’s “The Thing“. I had always loved this film and was looking forward to covering it in The Vault. But after a lengthy debate with another horror webmaster who will remain anonymous, I was unfortunately convinced that due to its sci-fi content, “The Thing” didn’t warrant placement in the House. I battled for months with the question of sci-fi and horror being able to share the same space and with the many emails I received from the fans on this subject, I decided to put “The Thing” back where it belongs in The Vault. There are so many reasons to like this film, yet it was universally panned by the critics when it was originally released in the summer of 1982. David Denby of New York magazine called the film “more disgusting than frightening, and most of it was boring”. Vince Canby of the NY Times declared it “too phony looking to be disgusting….qualifies only as instant junk”. Many other critics bantered Carpenter’s effort citing a lack of characterizations, tension, and a story driven by overdone special effects. Some went as far as to call it “Alien on Ice”. There were a few brave souls who saw the genius right away in “The Thing”. Alan Frank of the Daily Star maintained “you won’t find a better spine-chiller than The Thing”. Quentin Tarantino has called “The Thing” one of his favorite movies of all-time and the basic premise of “Reservoir Dog”–someone who is not what he appears to be– was definitely influenced by this film. Well, enough of what the critics said about “The Thing”, now let me share my feelings on the film. The foundation for my love of these films stems from many areas. First, is the direction of John Carpenter. 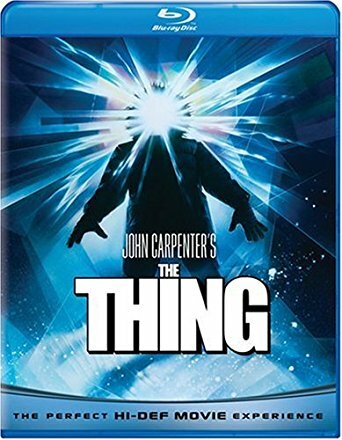 As any visitor to this site will quickly surmise that John Carpenter is one of my favorite directors and “The Thing” is by far his most endearing film for me. Although, he wasn’t the first choice to direct this film (read more in “frightful fact” below), he was the perfect one. Because he was a fan of both John Campbell’s novella “Who Goes There?” and also of Howard Hawks’ “The Thing From Another World“, John Carpenter was firmly entrenched in the spirit of the story. His faithfulness to Campbell’s story intermixed with Bottin’s special effects helped to bring “The Thing” to life and make it into one of the greatest sci-fi/horror films ever made. Carpenter used all the great techniques that he accumulated through his many years of independent filmmaking ( “The Thing” was JC first big-budget studio film) and with his vision truly made a film for the fans. The second point I would like to highlight about this film is the storyline. Bill Lancaster masterful crafted a story based in a “sense of fatality”. He created strong individual characters, which Carpenter brought to life so richly on screen with the help of the superb cast. The film’s strength lies in it’s believable and this is one reason why it is womanless. Even the hero of the film, Macready isn’t your typical one-lining Rambo-type superhero destiny to blow up everything and save the world, but rather he is an average “Joe” bent on trying to survive or destroy The Thing. The paranoia of the moment seeps out and engulfs the viewer into wondering “Who is human and who is The Thing??”. We, nor the characters, never really know until The Thing shockingly decides to reveal itself. It is the ultimate who-done-it. The “blood test” scene has to be one of the most tension-filled moments ever to grace the silver screen. Classic cinema!!!! Finally, the secret to the overall success of this film lies in the one point that many critics cited as it’s the main fault, the special effects. The one word that describes the special effects on this film is STUNNING!!!!! Sure Carpenter’s direction and Lancaster’s script were great, but the believable of the film was brought to life by Bottin and his team. Over $1.5 million was spent on the film’s effects and it was well worth every penny. Without the masterful transformations of The Thing (i.e. kennel, defibrillator, blood test, and ending), this could have been another bad b-movie (ala a man in a monster suit), but rather we are left feeling hopeless by the creature’s sheer power and in our understanding of the paranoia that each team member must have felt as he tried to determine if the man next to him was who appeared to be. Rather than diverting the storyline, the effects propelled it. They made The Thing something that has traversed my nightmares, as well as, many others for years. I really can’t say enough about Rob Bottin and his crew’s efforts other than they are the cornerstone in the foundation of this great film. Antarctica Winter 1982. As these haunting words cascade across the opening scene, the viewer is left wondering if this chilling netherworld is, in fact, our own. Seeming like the distant landscape of some lost alien world, the stage is set for a battle against the ultimate in alien terror. Alone and cut off from the rest of the world, the lives of the 12 member team at the United States National Science Institute Station 4 are abruptly interrupted by a barrage of gunfire. The serenity of this frozen utopia is dashed by what appears to be a couple of cabin-crazed Norwegians bent on destroying a lone wolf dog. Unfortunately, no answers are found, because the Norwegians accidentally blow up their own helicopter and are shot dead by Garry (Donald Moffat), the station commander. All that is left is the dog who quickly makes friends with Clark (Richard Masur), the animal handler, but things are not what they seem. Confused by these events, ex-Army helicopter pilot Macready (Kurt Russell) and Dr. Cooper (Richard A. Dysart), decided to head out and check on the camp of their recent visitors. With a storm beginnings to close in, Macready and Cooper find the Norwegian camp devastated by fire and everything apparently dead. They gather some notes, video tapes, and remains to take back with them. As the night temperature begins to fall, an unwelcome guest finally reveals itself, as The Thing and the team begin their struggle for survival. After another expedition to the Norwegian camp, they determine that the enemy they now fight is not of this world. Having been frozen for 100,000 years in the ice, this shape-shifting alien has the ability to assume the identity of any living thing it comes in contact with and now 12 men stand in it’s a way. Reading like Agatha Christie’s “Ten Little Indians“, paranoia rips through the station as each man begins to question the actions of his comrades. Who is human and who is The Thing?? Macready quickly tries to assume control of this hostile environment and comes up with a test to determine if someone is The Thing, but time is running out on mankind. An all-time classic mixture of elements from both sci-fi and horror genre. “The Thing” was masterfully directed by John Carpenter and exquisitely brought to life by Rob Bottin and his crack effects team. This is by far my favorite John Carpenter film and a must-see for any fan. The script is based on the story “Who Goes There?” by John W. Campbell, written in 1938. He first published under the pseudonym, Don A. Stuart. Unlike the original film, John Carpenter’s “The Thing” doesn’t include any females in the cast of the film. The only female presence in the film is the voice of Macready’s Chess Playing computer. Except for this cut scene, click here. The Thing was the first film that Carpenter directed where he did not write the script. The script was written by Bill Lancaster (son of Burt and scriptwriter for “Bad News Bears”) and is based closely on the original 1938 story. Unfortunately, Bill died in January 1997 from a heart attack. 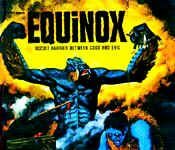 This is the first film in what John Carpenter calls his Apocalyptic Trilogy. The other two films are “Prince of Darkness” and “In the Mouth of Madness”. “The Thing” was filmed on a reported budget of $10 million dollars with some sources at Universal stating it was as high as $15 million. A budget of $1.5 million was spent on the special effects. The original budget for effects was estimated to be half that, but the final product proved that the money was well spent.Check out these pictures taken from MacFarlane’s site for three “Thing” figures scheduled for a fall release as part of their Movie Maniacs Series III Line. This is the first film of John Carpenter’s where he didn’t compose the film’s score. Those duties were masterfully filled by famed Italian composer Ennio Morricone (“The Good, the Bad, and the Ugly”). Included on this page for your listening enjoyment is Joe Doria’s (from The Spot) original MIDI composition based on the Humanity II track from the score of “The Thing”. Jed was the name of the main wolf dog. On the commentary of “The Thing” DVD, Carpenter raves about Jed’s acting ability. An actor with no arms and wearing a latex mask was used in the classic defibrillator scene where Dr. Cooper loses his arms. The filming took a year and five weeks to complete and Rob Bottin worked 7 days a week for the entire shoot. He went as far as to live at the studio. After the conclusion of the film, he checked himself into the hospital for some much-needed rest. Stan Winston and his crew were brought in as a favor for Rob Bottin to do the puppet work for the kennel scene where The Thing first reveals itself. Three locations were used in shooting the film. A glacier in Juneau, Alaska served as the background for the shots involving the alien ship. At a location in Stewart, British Columbia, the exterior shots for both the American and Norwegian camps were done. And back at Universal, all the interior shots were done. Being released during the “summer of E.T.” spelled box-office doom for this film. The scene filmed at the Norwegian camp was actually the charred remains of the American camp from the end of the film. Rather than go to the expense of building and burning down another camp, Carpenter decided to re-used the destroyed American camp for these scenes. Buy Anne Billson’s “The Thing: BFI Modern Classic” an excellent overview of the making of “The Thing” at Amazon.com. Subscribe to Fangoria by calling 1-800-877-5549. A yearly subscription (10 issues) in the U.S. for only $37.87. Foreign subscriptions for only $46.97 (U.S. funds). Order now!! !